Aji Chombo Peppers assure a hot time is to be had by all. Autumn is just a week away, but activities are hot as ever in Wakulla County’s home gardens. While many summer crops are winding up, one is still producing consistently. Sweet and hot peppers are the warm-season favorite still delivering a generous bounty. The popularity is possibly traced to the variety of cultivars within this genus which are available for every taste and culinary tradition. The peppers grown in most local gardens originated in Mexico and have been grown for over 5,000 years. These members of the Capsicum genus, but are not related to the spice black pepper which is produced from peppercorns native to India. Commonly known plants in the same botanical family, Solanaceae, include tomatoes, potatoes and eggplant. The Capsicum peppers were introduced to Europe by Spanish traders returning from the New World. Their rapid spread to cultures and countries around the globe is a tribute to their usefulness and ease of production. Over the years plant breeders on every continent have produced peppers which met the taste and needs of diverse populations and specific environments. 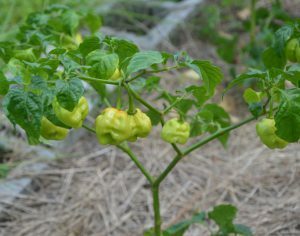 With the increased interest in locally produced food, the UF/IFAS Wakulla Extension Office is currently growing several varieties in the demonstration garden to determine if production is possible locally. Jalapeno peppers are one of the selections. This pepper variety originated in Mexico and has a long history of use by the Aztec culture long before the Spaniards arrived. Its named was derived from and indigenous term for the city of Veracruz. This thick robust pepper ripens to a deep red with a distinctive spicy flavor. It can be used fresh, in dishes, and dries easily. It is a prolific producer in the Wakulla Extension Demonstration Garden. Another test selection is the Cubanelle or Cuban Pepper. It has an elongated shape and is slightly spicy. This pepper can be eaten when it matures to a yellowish-green appearance, but ripens to a bright red. As the name implies, it is popular in Cuba and other Caribbean locations as an ingredient in Latin dishes. Carmen is another sweet pepper growing in the demonstration garden. It is an Italian bull’s horn type which has an elongated shape and is six inches long at maturity. The medium thick flesh is the sweetest when it is ripe red, but these peppers are sweet even when green. One of the improved traits is the earliness to reach red ripeness. Like all peppers, Carmen will produce the highest number of peppers when grown in full sun, and given proper nutrients and water. For those concerned with watching their weight, peppers are rich in vitamins, low in calories and add bright color to a variety of dishes. For the patient gardener red bell peppers are simply mature green bell peppers, but with more vitamin C and beta-carotene. As a bell pepper ages its flavor becomes sweeter and milder. UF/IFAS Master Gardener Bill Osborne is managing the pepper demonstration plots and the pepper plants. He is a graduate of the 2013 Master Gardener class. 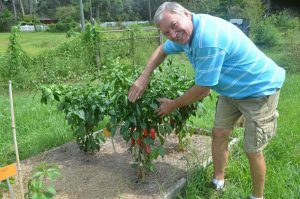 Master Gardener, Bill Osborne, shows some of the Emerald Fire cultivar Jalapeno peppers which can be grown in Wakulla County. Visitors are welcome to view the UF/IFAS Wakulla County demonstration garden from 8:00 a.m. to 5:00 p.m. Monday through Friday. Sweet or fiery, peppers are an easy to grow spice of life. To learn more about growing peppers in Wakulla County, visit the UF/IFAS Wakulla County website at http://blogs.ifas.ufl.edu/wakullaco or call 850-926-3931.